Finally a battery Chainsaw that seems to be worthy. Great Reviews with Video's also! Thanks Randy! I just might buy me one of these. Just didn't know what to buy. That's a really nice option for an ATV plus you don't have to carry gas for it , too . Home Depot on Hanes Mall Blvd in Winston has 3 of the saws in stock. What a saw. As heavy as a gas if not heavier. Does not feel like a Toyota. I might get one eventually since my wife wants the 58v string trimmer. Ah Man, Randy you stole MY idea!! Get an extra battery and have 1 charging while you ride. I'm going to get 2 of them and mount them on the front sticking out both sides so I can just cut and ride!! Only one thing--they don't seem to sell a replacement chain for it. An Oregon chain with 56 links might work but it is strange that Echo doesn't seem to have one. Try looking and see if I'm wrong. Chain specifications: 3/8 in. pitch, low profile narrow kerf, .043 in. chain gauge, 6-tooth drive sprocket. Length of Bar: 16 in. I saw that too. Only thing is the part number doesn't come up on any Echo or Home depot site. I'm just assuming that if you want a replacement you need to get an Oregon with the same specs. Just thought it would have been nice to be able to get the exact chain for the bar. I thought .375 56 link was common chain. I think its just a case of it being so new. On Echo's website they didn't even list a part's list for that model? After last ride in Ky and the fact I have the widest machine in the club I feel I need one! at least that's what I'm telling the wife. My local Home Depot has 3 in stock. Hopefully by the time I dull the chain they will be easy to replace! I saw some youtube video's of it cutting through 12-16" trees with no problems. 90PX056G Oregon Saw Chain. It's fairly common with several options. Just picked it up about 1 hr ago. Battery charged in just .5 hr! It really feels lighter than my gas 14". Only bad thing is no case, and actually wish it was a 14" instead of 16". Maybe i can get a 14" bar and chain later for easier storage. I will bring it on next ride for sure. The only saws that come with case are the cheapo Poulans and such. Finding a case should be easy on that one. I'm interested in seeing it cut. To bad you're not coming on the Matewan trip, if its like last year you'd see it in action for sure! Ok, so I wanted to see how it worked so I tried it out on the tree in my front yard. 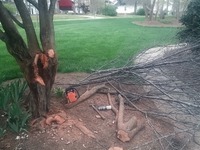 First off it has a brand new blade and half the tree was dead so probably not the best first use to base a good opinion but I did make a lot of cuts and it worked great. It has a smart battery with build in power indicator that you can push to see how much charge is left and will flash red in the center when its low. After all the cuts it still had 3 out of 4 bars left. Comes with a 5 yr warranty also. The tree looks like a Frankenstein tree now but it was that or let it rot from the inside out! That battery power indicator is just to make you feel good. LiIon batteries go from full to dead instantly. My Ryobi's can show full and dead quickly. I would expect 1 battery to cut 12 or so 10" cuts or 28+ 5" cuts before needing charging. That would be pretty good. Echo claims 112 6" cuts so that would be 56 12" cuts! I would be major impressed but I wouldn't bet $$ on that. Echo is probably correct in soft pine. I doubt it in hardwoods.